In a remote valley, close to the border with Tibet, at an altitude of 3500 metres, lies the Nyeshang Valley. The people of this valley, known either as Nyeshang in Tibetan or Manang in Nepalese, have both cultural and ancestral connections with Tibet. Their language shares links with Tibetan. 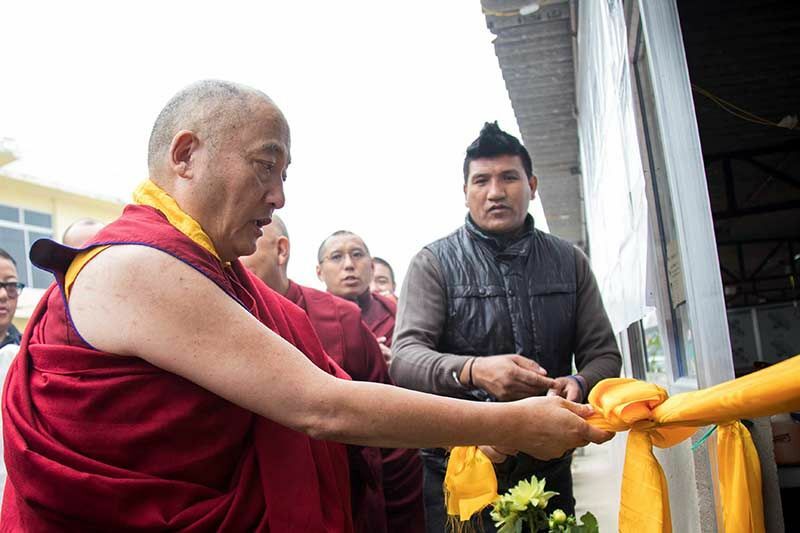 This year they are the main sponsors of the Kagyu Monlam, the first time in its history that it has been sponsored by a whole community such as this. The people of Nyeshang live on a mainly vegetarian diet. Because of their Buddhist beliefs they do not rear large herds of yak or other livestock to be sold for meat; the livestock they do have is for producing milk, yoghurt and cheese for their own needs only. At that altitude, as just one harvest of wheat, buckwheat and potatoes is possible each year, the men have traditionally supplemented the family income by trading. They would collect herbal medicines to sell in India, use the money to buy jewellery then travel on to sell the jewellery in Burma, Singapore and as far as Malaysia. Because of this necessity to travel as traders, King Mahendra of Nepal personally gave a special dispensation granting these people the very first Nepalese passports, many years before passports became generally available. These days tourism has become the major industry in the valley. 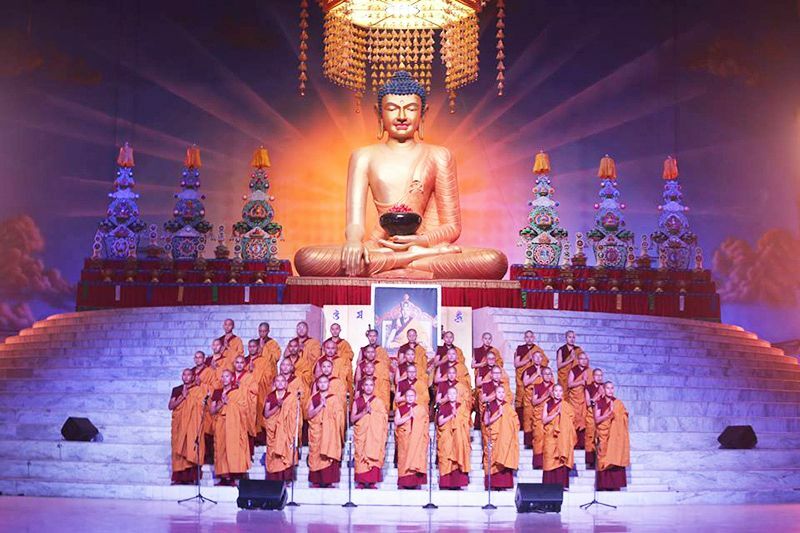 The Nyeshang relationship with Buddhism, and more specifically with the Kagyu tradition, stretches back many centuries to the time of the great Tibetan mystic, Jetsun Milarepa. In the 11th century, Milarepa came to Nyeshang and spent six years meditating in a cave there. At that time the men of Nyeshang were hunters, hunting deer with dogs. It is said that one time when Milarepa was deep in meditation, he was disturbed by a deer being chased by a dog. Following behind was a Nyeshangpa hunter called Chirawa Gonpo Dorje. When Gonpo Dorje reached the cave, he found his dog sitting docilely on the left of Milarepa and the deer on the right. When Milarepa refused to let him kill the deer, the hunter became very angry and tried to shoot Milarepa, but his arrows had no effect. You’ve got a man’s body, but an ogre’s face. Ogre-faced man, listen to Mila’s song. But when I see one like you, there’s nothing rare at all. You scoff at the suffering of the lower realms. But negative deeds won’t bring you what you want. Taming outer appearances will never work. Killing this deer will not satiate you. Tame your inner mindstream and be free of foes. Practice genuine Dharma – how great that would be. I’ll teach you the practice of Mahamudra. 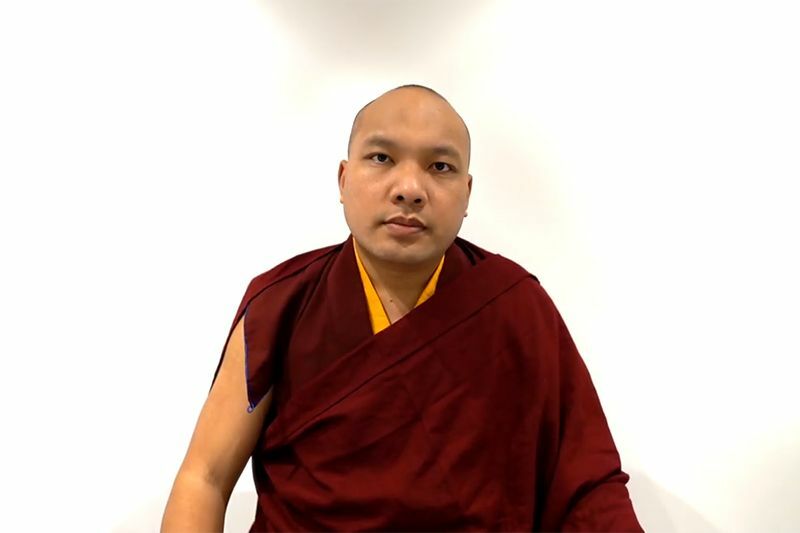 It is not easy to sponsor the Kagyu Monlam Chenmo; there is a waiting list. 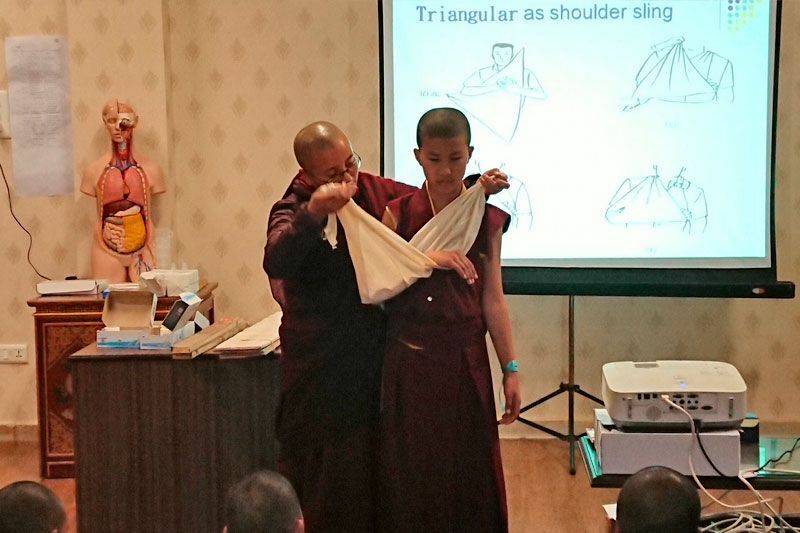 After nine years, the Nyeshangpa have finally become the main sponsors, for the 36th Kagyu Monlam. Of the families in the six villages, nearly all have contributed. There are more than 700 sponsors in all, and of these 400 people have been able to come to Bodhgaya to attend the Monlam itself. 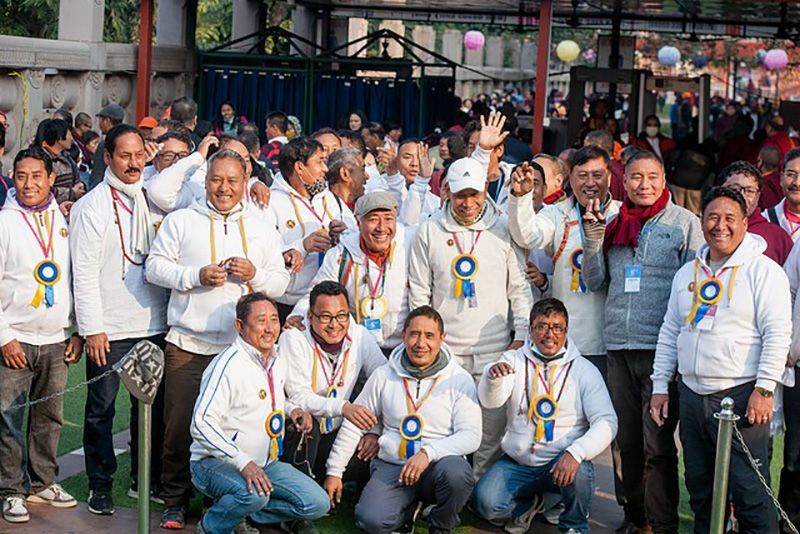 They have combined their sponsorship with service: thirty young men are working as dharmapalas; twenty-five women are serving tea and lunch; an additional ten women help serve lunch; and forty more women are volunteers in the kitchens, preparing vegetables and washing bowls. As the main sponsors they were honoured in the Sixteen Arhat Ceremony: representatives of the Nyeshang community followed immediately after the labrangs in making offerings to the arhats. 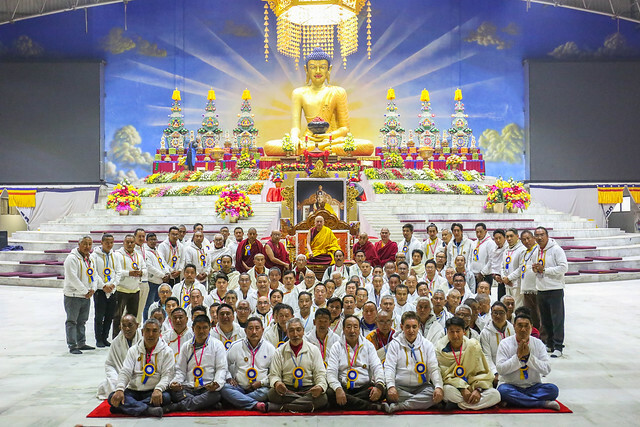 They also had a group photo taken with His Eminence Goshir Gyaltsap Rinpoche.